H-E Parts International tailored solutions doubles coolant life. 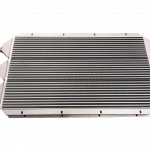 H-E PARTS COR COOLING (H-E PARTS) ARE A LEADING PROVIDER OF RELIABLE, APPLICATION SPECIFIC HEAT TRANSFER SOLUTIONS. H-E PARTS MANUFACTURE AND SUPPLY HIGH QUALITY, INNOVATIVE PRODUCTS THAT ARE TAILORED TO OUR CUSTOMERS SPECIFIC REQUIREMENTS. H-E PARTS IN-HOUSE ENGINEERING, PRODUCT AND SERVICE OFFERINGS, GUARANTEE WE SUPPORT CUSTOMERS THROUGHOUT THE FULL PRODUCT LIFECYCLE AND ENSURES THE LOWEST TOTAL COST OF OWNERSHIP IS ACHIEVED. 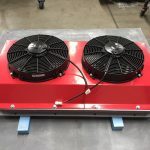 A family owned and operated trucking company in Australia were looking for a solution to reduce overheating issues experienced with their Kenworth K200 trucks. The family-run business is known for providing a reliable and efficient transport service to their large and long-standing customer base, so it was important to seek a solution through a reputable dealer. The customer approached H-E Parts and asked them to provide a solution that would extend life and improve the efficiency of major internal components related to the fuel system, power steering, and the transmission. H-E Parts worked closely with the customer to design a multi-combination cooling pack, that was capable of cooling three mediums at once. 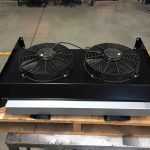 The multipurpose remote mounted cooling pack consists of a three in one heavy duty bar and plate cooler, custom built steel fan shroud and two electric thermal fans (12V or 24V). The heavy-duty aluminum bar and plate design means the end user is being supplied the most durable solution for their on-road transport application. Since the installation of the triple cooler the power steering fluid life has been doubled, the power steering fluid lifespan has gone from being changed at 100,000 km’s to 200,000km’s (62,000 – 124,000 miles). The transmission oil now does not get changed during the transmissions life of 750,000 km’s (466,000 miles) the previous life expectancy was 350,000 km’s (218,000 miles). The fuel system being cooled allows for extended life expectancy for hoses, injectors, and seals. The fuel cooler can also deliver added savings through improved fuel consumption (depending on driver conditions). Since the implementation of the initial multi-combination cooling pack, the customer has installed the unit to many of their trucks, resulting in a larger cost saving due to better fuel economy, less servicing, replacements and downtime due to overheating are being achieved on multiple units. 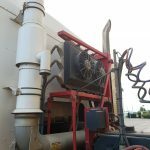 The customer also benefits from our single oil cooling packages to keep the hydraulic oil cool on their grain trailers. The universal solution mounts conveniently to the side of the grain trailers and has reduced the risk and expense of hydraulic system failure. H-E Parts have been servicing and supplying to this customer for many years now. In that time, further work has been awarded to H-E Parts due to their success and continuous development of their products and service.